One of the best parts of roasting meats is the aroma that fills your home while they are cooking and which linger long afterward – if you are lucky. Two days later and my home still smells incredible from this French beef stew made with red wine and rich beef stock. Julia’s original recipe took the better part of an entire day, had many steps that do benefit the final flavor, but some can be simplified to make this easier to make, a little faster, yet still give you the intense flavors that make this stew one of the classics that every culinary student learns in school. There is beef stew and then there is Bourguignon, and though they both utilize the same technique, they are as different as night and day. Beef stew is wonderful comfort food that always reminds me of my mom and family meals around the table with lots of jokes, stories, and laughter. But when I want to dial it up, I make Bourguignon. You need to use a tough cut of meat with plenty of fat running through it for this dish. The slow cooking method melts the fat, tenderizing the meats and leaving you with the most delectable meal you have ever eaten. And one of the best things is that it takes a cheap cut of meat. So you eat like king on a pauper’s budget! Partially frozen meat is easiest to cut, so I cut the London broil into cubes the night before and store it in a resealable plastic bag in the refrigerator. And I chop the onion while I am at it, storing them in the same bag. The next day I set up a small baking sheet with layers of paper towels. Working in batches, I pat the beef dry and transfer them to the prepared baking sheet. Top with more paper towels and continue patting the beef dry because as Julia taught us, wet beef just steams and never really forms the deep, wonderful browning that creates the intense flavors. I always use my Dutch oven for this recipe. While you may be tempted to use a slow cooker, it just will not give you the same depth of flavor. The reason is you really need to brown the beef thoroughly, in batches, and then the onions and carrots in the same pan to create the intense layers. Then when you deglaze the pan with the wine and stock, all those beautiful brown crispy bits melt and create the unbelievable sauce that the meat cooks in. A slow cooker cannot recreate these layers. Once you’ve got everything browned and combined, place the pot in the oven and forget about it for a few hours. When you are cooking with wine do not take shortcuts and use cheap wine. And for heavens sake, if I ever hear you bought “cooking wine” I will show up on your doorstep to horsewhip you! You want a wine that is good enough to drink on its own because as it reduces the flavor becomes more pronounced and any bitterness will be amplified. You also don’t have to break the bank and buy an extremely expensive bottle. A good, solid, middle-of-the road wine is perfect. If you are unsure of which wine to use for this dish, I am happy to make recommendations or you can speak to your wine merchant. They are always delighted to help us choose the best bottle for our purposes. Always smell the wine before adding it. If it smells like vinegar, it will not be good in the stew! If it is on the edge, don’t push it. It is better to throw it out and use another bottle than to ruin an entire pot of this beautiful beef! This is one of the most wine-friendly meals. It is cooked with a whole bottle of rich red wine that is balanced with beef stock, softening the potential bitterness of the broth. Usually I serve this meal with more of the same wine I cooked with, but this time I served a beautiful, big cabernet sauvignon from Robert Keenan Winery, Napa Valley. If you haven’t discovered this amazing winery, now is a chance to explore new territory. When the days are cold and the nights seem to last forever, make this meal for your friends and family and gather around the table to share it. I guarantee that you will hear sighs of delight as they dig into their bowls. It is worth every moment of preparation and the love you put into it will transform every person who has a bite! 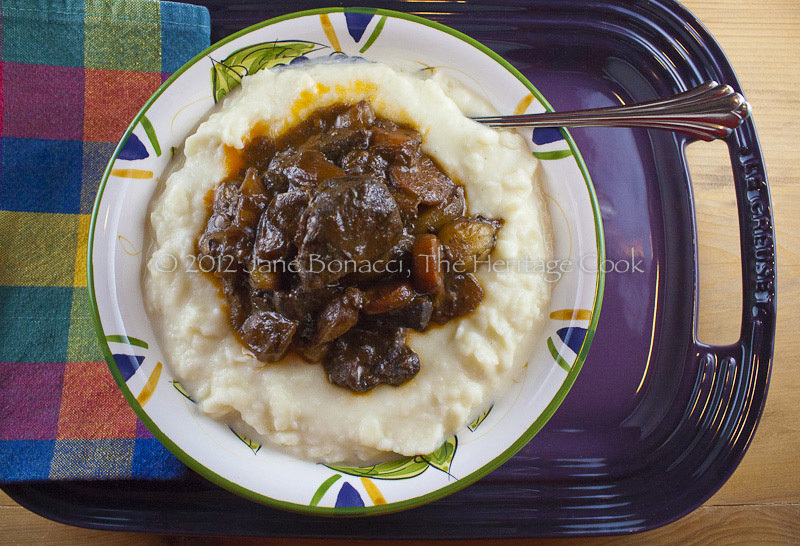 What are some of your other favorite slow-cooked meals? The biggest tip that Julia taught all of us was to start with dry meat cubes. Too often we rush this step and the meat winds up steaming instead of getting a really dark sear. This is a perfect recipe to use Bob’s Red Mill All-Purpose Gluten-Free Flour Blend. Because it contains garbanzo flour it is more suited for savory cooking than sweets. This recipe only needs 2 tbsp flour to thicken the sauce. If you prefer, you can substitute cornstarch, arrowroot, or potato starch as well. Braising is the technique of slowly cooking foods in liquid and one of the foundations of great cooking. It keeps meats moist and tenderizes even the cheapest, toughest cuts. Meats that you normally have to sharpen your knife to cut, let alone chew, become meltingly tender with low, slow cooking. The other benefit is that you do not have to do anything as this miracle happens. Just put everything in a pot with a tight-fitting lid, put it in the oven, and let it simmer happily for a few hours. The cooking liquid reduces and becomes a richly flavored sauce. Make sure you serve any braised meats with something that can help you get the most out of the amazing sauce. I prefer mashed potatoes or pasta, but many people will serve this over cooked rice or other grains. You could even use slices of bread in the bottom of the bowl. Use whatever makes you happy because you are going to want to eat every single drop! Prepare the Stew: Cut the beef into cubes and pat dry with paper towels. Set aside. Chop the carrots and onions; place in a bowl. In a small bowl, combine the flour with the salt and pepper. In a very large bowl, combine the wine, beef stock, and tomato paste. Whisk until smooth. Heat a large Dutch oven or other heavy pot over medium-high heat. Cook the bacon until the fat has rendered. Using a slotted spoon, transfer the bacon to a paper towel-lined plate. Working with about 1/3 of the beef at a time, add to the grease in the pan and cook until browned on all sides, turning as needed with tongs. When browned, use a slotted spoon to transfer the beef to a large bowl. Repeat with remaining beef, cooking in batches so that the beef gets browned and doesn’t steam. When all the beef is cooked, add the carrots and chopped onions to the same pan. Cook, stirring regularly, about 3 minutes or until they have softened slightly. Reduce the heat to medium, add the beef and bacon to the vegetables, and sprinkle with the seasoned flour. Toss with a spoon to distribute the flour mixture. Cook, stirring often, 5 minutes. Add the wine/stock mixture to the beef. With a wooden spoon, scrape the bottom and sides of the pan, releasing the residue and browned bits and adding their flavor to the stew. This is called deglazing the pan. Add the garlic, shallots, thyme, and bay leaf. Stir to distribute, cover with a tight fitting lid, and place in hot oven. Cook the beef for 3 to 4 hours or until fork tender, stirring once an hour. About 30 minutes before it is done, stir in the pearl onions. Replace the lid and return to the oven. When the meat is tender, remove from the oven and set on the stove, still covered, to rest while you make the mushrooms. Cook the Mushrooms: In a skillet, melt the butter over medium heat. Add the quartered mushrooms and sauté for about 4 minutes or until have begun to brown, given off their liquid, and are starting to become tender. Add the garlic, thyme and salt and pepper to taste. Cook another minute or until the garlic is fragrant. Be careful not to burn the garlic. Transfer the mushrooms mixture to the beef and vegetables. Taste and adjust seasonings with salt and pepper. Ladle the stew over bowls of mashed potatoes, cooked rice or boiled noodles. You can serve extra sauce at the table. Make sure you have spoons at each place setting so your guests can get every single bite!